Bowing – the string crossings would be easier for lower strings up-down rather than down-up, but the opposite is true for the upper strings, and we know who wins this battle in the orchestra!! 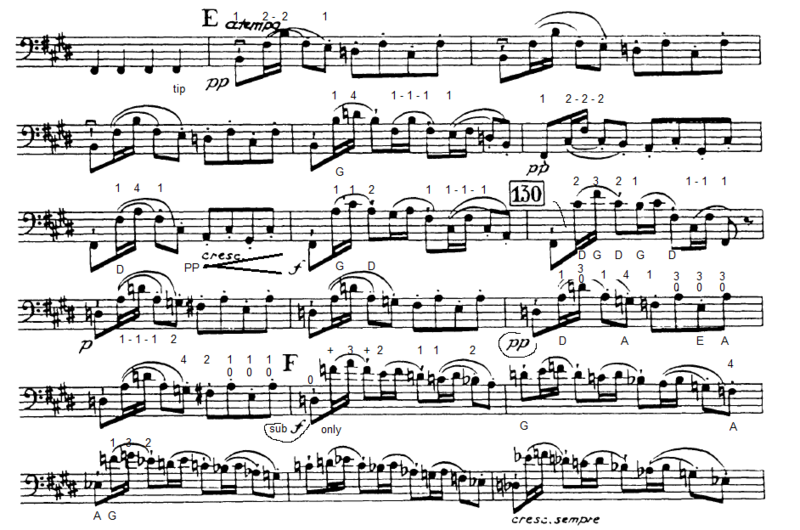 bar 134-135 – subito f, the F and A, 2nd and 3rd of 135 are tricky, either as a high string crossing, or to get in position with thumb on F as I play it. It is often the case that the problem with a passage that is wrong is not the notes that are wrong but the preparation beforehand. I find that I stand a better chance of getting my thumb on F for the 2nd note of bar 135 if my 3rd is stopping an A at the end of the previous bar. Ex 8 is designed to make this happen. This keeps my L hand in position. When I play the open D at the start of bar 135, my 3rd is holding an A, stopping the F with my thumb is likely to interfere with the open D. After the D, I put my thumb on F, and raise my 3rd finger.